Wilesco is renowned for their high-quality steam engines and they have not let us down once again with the gorgeous Wilesco D16 stationary steam engine. A fully working steam engine that has been modelled on the original engine from the industrial era, this is a beautiful piece of machinery that would not look out of place in any hobbyist’s collection. Perfect for budding enthusiasts or for use as an educational tool, the D16 can be used to drive many other accessories and be modified by those that know how. With a fast-moving engine that will run for a good 20 minutes per use, this stationary engine will provide a sound that can only be described as sublime. 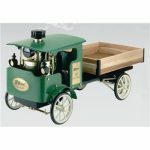 Not be used by children under the age of 14 without adult supervision, the Wilesco D16 steam engine has some parts that can move quite fast while anything that involves fire and heat should obviously be used with care. The Wilesco D16 has nickel polished finished brass boiler that has a capacity of 250ml and a glass sight indicator. Complete with a cream coloured brick embossed finish, the boilers housing contains two foot-bridges. 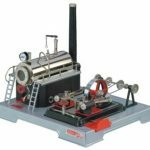 Containing a reversible twin-acting brass piston cylinder and a flywheel with a grooved pulley and die-cast railings, this stationary engine has the power to drive a selection of other Wilesco models such as two-wheel grinders and drilling machines. Operating the Wilesco D16 is done via the steam whistle with pullable chain, steam regulator valve and spring loaded safety valve. Mounted on a sturdy painted metal base, the D16 generates realistic looking smoke by using condensed water that is fed to a hidden tank at the rear of the boiler housing. With dimensions of 31 x 25 x 28cm this is a good sized engine and with a weight of 1.8kg, it is one of the heavier in the Wilesco stationary engine range. Equally good in operation or as a decorative piece, this steam engine is certainly one that will improve anyone’s collection. As with any steam engine, maintenance is extremely important and in some cases quite a timely expense. However, many will tell you that this just adds to the fun of this hobby as there is nothing quite like a steam engine in tip-top condition. 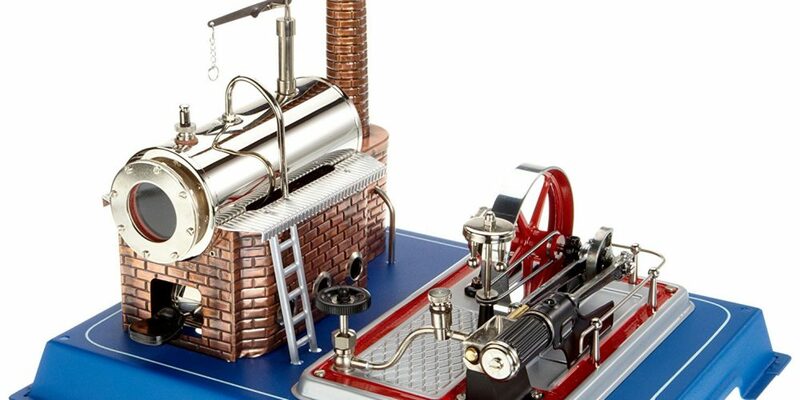 Avid collectors and hobbyists alike will not be disappointed with this beautifully crafted and well-built steam engine by Wilesco. These steam engines when well-looked after and rarely used can become a good investment as well as a great display piece. Even when used regularly but well-maintained, model steam engines are something that can stay in the family for many decades. 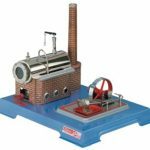 Ideal for those looking to get into this fantastic hobby or those that want another to add to their collection will not go wrong with the Wilesco D12 stationary steam engine. Certainly a good looking and powerful engine, the D12 is well worth checking out.